What Gave This Little Boy Lead Poisoning? Brenda Goodman is a staff writer for WebMD. Andy Miller is editor and CEO of Georgia Health News. This investigation was supported by a grant from the Arthur M. Blank Family Foundation. Sept. 6, 2017 -- Almost as soon as he could balance on his plump baby legs, Austin Poteet loved to pull himself up to look out of windows in the house his family was renting in Ashburn, GA. While he stood at the window, he may have found more than just a way to watch his dad mow the lawn, says his mother, Montie Poteet. She believes he found flecks of old paint around the house and porch that stuck to his tiny fingers and tasted sweet when he put his hands in his mouth. He sucked on his fingers often, as most babies do. When his pediatrician tested his blood at 16 months during his regular checkup, Austin’s lead level was 17 -- more than 3 times as high as the CDC’s level of concern for children. Montie thinks the paint in the house -- which was built in 1904, according to property tax records -- may have had lead in it, and it may have permanently damaged Austin’s brain. “Just looking at historical houses now almost makes my skin crawl wondering how much lead could still be there,” she says. When a child tests positive for at least 10 micrograms per deciliter of lead in their blood, the Georgia Department of Public Health is supposed to investigate to determine where the lead came from. The higher the child’s lead level, the faster the state is supposed to act, according to the department’s own internal guidelines. The Poteets can’t be sure how Austin was poisoned because caseworkers for the Georgia Department of Public Health took months to contact the family after he tested high. Lead is sneaky. Kids can be exposed to it by drinking lead-tainted water, by eating lead-based paint or breathing in lead dust, from lead fumes when old paint is removed by unsafe methods, or even by coming into contact with it through tainted food or consumer products. Montie was pregnant with her second son when Austin tested positive. She was afraid that whatever was poisoning him might also be getting to her and her unborn child. The family moved as soon as they were able to scrape the money together for a new apartment. They left about 2 weeks after high amounts of lead showed up in Austin’s blood. The Poteets were long gone from the house by the time the Department of Public Health contacted them. The department never inspected the rental house, though it may have been the place that poisoned Austin, records and interviews show. What’s more, Montie Poteet says when they signed the lease, they never received a warning that there could be lead in the house. Federal law requires anyone who is renting or selling a home built before 1978 to notify future occupants that there could be a lead threat. “Oftentimes, landlords don’t have any knowledge of whether or not there’s a lead threat. But you still have to fill out the form and check a box that you don’t know,” says Rebecca Morley, director of the Health Impact Project at the Pew Charitable Trusts. Jimmy Ponder, the Poteets' landlord at the time, says he grew up in the house, which he has rented to at least two families with young children. No one from his family ever had a problem with lead, and he wasn’t aware of any threat. Under Georgia law, landlords are required to clean up any home where a lead-poisoned child under age 6 is living. Because the state was slow to act, the home appears to have never been properly tested or cleaned up by the landlord and continues to be rented. Morley says that a lot of homes that are causing lead problems are managed by smaller-property owners who may not be as sophisticated at property management. They’re harder to reach and the properties are often in disrepair, Morley says. On the day Austin tested high for lead, the pediatrician told Montie they needed to get another blood test to confirm it. That same day -- Nov. 17, 2015 -- she took Austin to the local hospital, where they drew blood from a vein, which is considered a more accurate way to test. That test was even higher: 18 micrograms per deciliter. The CDC says that no amount of lead is safe for kids. The agency says a child’s lead level is elevated when their blood lead level is 5 mcg/dl or higher. As soon as she got home, Montie started searching online for information. She read about lead in old paint and realized that the chipped surfaces all over their house could be a big problem. More than a third of homes in the U.S. have lead-based paint. More than 3.6 million preschool-aged children live in them, according to the U.S. Department of Housing and Urban Development. The risk in these homes is often concentrated around windows. As they are opened and closed, friction grinds the paint into a fine dust that kids can easily pick up on their hands. Recent studies have found that replacing contaminated windows can lower the amount of lead dust in a house by half. Montie thought about how much time Austin spent standing in the window, and she thought paint was probably the most likely danger. She talked to her husband, and they started making plans to move. Around the same time, she started to notice that Austin’s behavior was changing. It took a long time for Austin to learn how to crawl and then to walk. At his next checkup, Montie was given a checklist of developmental milestones Austin was supposed to be reaching. She realized as she filled it out that he was far behind where he should be. But there was good news, too. By the end of December 2015, when the family had been out of their old rental house for about a month, a new blood test showed that Austin’s lead level was coming down. It was 5 mcg/dl, a level that studies have shown can damage IQ, but at least it was moving in the right direction. Soon after, at a follow-up visit with their pediatrician, Austin was lying on the floor on his stomach playing with a toy car. The pediatrician referred them to Atlanta’s Marcus Autism Center for more specialized testing. In April of 2017, Austin, who was almost 3, was officially diagnosed with autism spectrum disorder. Under the law, an elevated level of lead in the blood is a “notifiable condition”-- one that is required to be reported to government authorities. Both doctors' offices and labs that do blood testing are required to make these notifications, says Rick Ward, executive director of the Georgia Chapter of the American Academy of Pediatrics. That notification goes to the Department of Public Health, and the department has guidelines about how to respond. According to those guidelines, a regional case manager should have arranged for an environmental risk assessment -- an investigation by someone who is trained and certified to identify lead hazards -- within 2 weeks of being alerted to the case by the state. These investigations are key because they help families find the source of their child’s lead exposure to prevent further poisoning. If a rental property is the source of the lead poisoning, the department has the authority to compel a landlord to clean up the lead as long as a child is living in the house. Too often, though, that doesn’t happen, and most state laws don’t prevent landlords from renting hazardous houses again. That means a single dangerous dwelling often poisons many kids, says Morley. In Jefferson County, KY, for example, one study found that just 79 homes accounted for a third of the children with high blood lead levels. In Chicago, 67 “high-risk” buildings poisoned nearly 1,000 children. “I get angry, but I’m limited by how the laws read,” she says. Case records for Austin Poteet, obtained through an Open Records Act request, confirm that the state was slow to act. Georgia’s lead program alerted its regional office to Austin’s case on Dec. 7, 2015, about 3 weeks after his high blood test. His file says that a 2-hour assessment was completed for Austin on Jan. 8, 2016. But that’s not really what happened. According to other notes in Austin’s file, January 8 was the day the case manager placed an initial phone call to Montie Poteet, leaving a voicemail message. Montie doesn’t remember getting that call. Nancy Nydam, director of communications for the Georgia Department of Public Health, confirmed that the assessment documented in Austin’s records was never done. Nydam says the computer system they use to track cases was new at the time, and many were confused about how to fill out some of the entries on the reports. The state’s next attempt to contact Montie Poteet was a letter dated Feb. 26. It was sent to her old address, so Poteet never received it. She says the first contact she remembers came near the end of March 2016, more than 4 months after Austin first tested positive. Case records document that phone call and the fact the caseworker sent her a questionnaire to fill out. Montie Poteet remembers not knowing how to answer some questions, like when her house was built and if it had ever been tested for lead. By October 2016, after Austin’s lead level had hovered around 5 for almost a year -- a level that’s still considered to be elevated -- the caseworker noted that the Poteets had moved out of the house they suspected had poisoned Austin. She recommended closing the case. Morley says that in some ways, the department’s response is an indication of what’s happened to federal and state budgets for lead poisoning prevention. “There was a pretty severe cut in 2010 to CDC’s program, and CDC is the one who funds state and local health departments to respond to kids with lead poisoning,” she says. Money started flowing again in 2012, but the funding was never fully restored, Morley says. “That really crippled the ability of health departments to respond rapidly and effectively,” she says. Morley was co-author of a recent report by the Pew Charitable Trusts and the Robert Wood Johnson Foundation that found removing lead paint hazards from older homes would protect more than 300,000 children nationwide. The Georgia Department of Public Health declined to respond to a question about whether the agency’s response to Austin’s case was acceptable. Austin’s autism diagnosis left his parents wondering if his lead poisoning played a role. Medical experts we interviewed for this story told us that lead poisoning does not cause autism, which is thought to be caused by genes and the environment. Instead, it’s more likely that kids with autism have early behaviors -- such as increased hand-to-mouth activity -- that make them more likely to have lead poisoning, says Lowry, who does lead investigations for children who’ve been poisoned. She’s had several lead cases involving autistic children. But children with lead poisoning can also have behaviors that may be mistaken for features of autism, says William Bithoney, MD, a pediatrician who sometimes offers expert testimony in lead poisoning cases. Bithoney managed general pediatrics and primary care at Boston Children's Hospital for 17 years. “There are several things that can happen with a child who is developmentally delayed because of lead, and they can look a lot like kids who have autism,” he says. Lead poisoning can delay language and lower IQ, and it can also make kids irritable because lead is irritating the brain, Bithoney says. Lead-poisoned kids can also become hyperactive or have trouble getting along with others because lead has affected their behavior -- all signs that might be mistaken for autism. In those cases, a thorough assessment is critical to teasing the two conditions apart. What is clear is that the harm from lead poisoning can be a bigger blow to a child who already has a fragile brain. He explains it this way: A child with a blood lead level of 20 can be expected to lose about 12 IQ points. If a child was genetically gifted with 150 IQ points, and they lose 12 from lead poisoning, “They can still be a reporter, a lawyer, or a physicist,” Bithoney says. 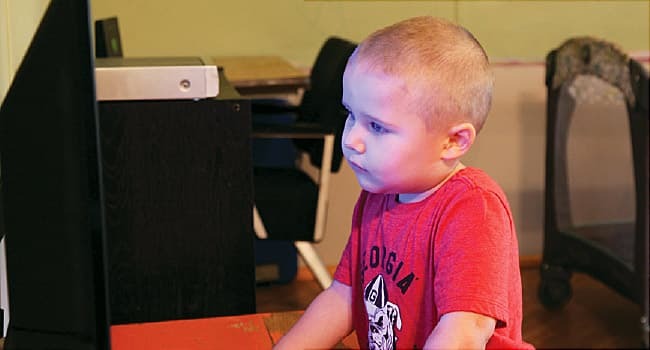 Another child who has an IQ of 80, who is borderline intellectually disabled, will have a very different outcome from losing 12 IQ points, he explains. “That can be the difference between functioning at home or requiring a sheltered environment, depending on what your innate IQ is, or not even being able to work or live in a sheltered environment,” Bithoney says. “Some of these lost IQ points, as you get lower, are more precious,” Bithoney says. Lead poisoning also raises the financial burden of caring for an autistic child by a lot. A 2014 study found that it costs $1 million more to care for an autistic child during their lives if they also have an intellectual disability -- the lifetime cost of their care jumps from $1.4 million to $2.4 million. The burden of lead poisoning falls disproportionately on poor families, since they’re more likely to live in older, poorly maintained housing. The high cost of caring for children with lead poisoning adds to substantial hardship these families already face. Montie Poteet says her family lives on her husband’s salary. After a recent raise, he makes $10.30 an hour as a forklift driver. The Poteets get by with one car, and Montie is careful to ration her phone calls because she doesn't always have enough minutes on her basic cellphone plan. Through the state’s Medicaid program for kids, Austin gets speech therapy twice a week. On those days, Montie drops her husband off at work and then takes Austin for his session. Montie knows that Austin also needs behavioral therapy, which would also be covered by Medicaid, but right now, the family can’t afford the gas it would take to make the 40-minute round trip to neighboring Tifton, GA, several times a week to get it. One way some families have gotten help is by filing personal injury lawsuits against homeowners insurance policies carried by their landlords. Corey Stern, a partner at the New York City-based law firm Levy Konigsberg, files lead poisoning cases for families across the U.S. He’s currently working on behalf of lead-poisoned children in Flint, MI. He used to have clients in Georgia, but he says a 2016 decision by the Georgia Supreme Court “dealt a real blow” to families like the Poteets. In a first-of-its-kind decision in Georgia, the court ruled that injuries from lead could be excluded under broad, standard language written into most homeowner insurance policies called a “pollution exclusion” clause. The ruling denied any compensation for Tyasia Brown, a young girl who was poisoned after she swallowed flaking chips of lead paint in a rental house. The decision has made it very difficult to sue over lead poisoning. Other states have held that insurance companies must pay lead poisoning victims, even if their policies have pollution exclusion clauses, since those clauses don’t specifically exclude lead as a hazard. Robert Chesler, an attorney with the firm Anderson Kill in Newark, NJ, says that in addition to Georgia, he knows of just two other states -- Oklahoma and Nebraska -- that ruled that pollution exclusion clauses should shield insurance companies from liability for lead poisoning. Austin, who is now an energetic and affectionate 3-year-old, is obsessed with bubbles. Montie says she has trouble doing dishes because as soon as she fills the sink, Austin wants to play with the suds. That’s a huge improvement over what he used to be able to do, Montie says, and she credits the speech therapy -- which he loves -- for his progress. Montie has spread blankets over the seat cushions of their couch because Austin, who is a picker, has plucked the upholstery off. Montie used to work as an ER tech at a local hospital. She quit her job when Austin was born, in part because she was afraid of bringing a serious infection home. Montie says she fights feelings of failure. Austin and his younger brother, 1-year-old Owen, just got lead tests this last week. They both came back at low levels. Nearly 2 years after the family’s ordeal began, they are finally all in the clear. Montie Poteet, mother of a child with lead poisoning, Ocilla, GA.
Jimmy Ponder, Landlord, Fitzgerald, GA.
Jennifer Lowry, MD, pediatrician and toxicologist, Children’s Mercy Hospital, Kansas City, MO. William Bithoney, MD, managing director, BDO Consulting. Corey Stern, partner, Levy Konigsberg, New York City. Robert Chesler, attorney, Anderson Kill, Newark, NJ. Rebecca Morley, director, Health Impact Project, Pew Charitable Trusts. Open records request, Georgia Department of Public Health. Jacobs, DE, Journal of Public Health Management Practice, Sept.-Oct. 2016. Rick Ward, executive director, Georgia Chapter of the American Academy of Pediatrics, Atlanta. Georgia Department of Public Health: Georgia Comprehensive Childhood Lead Poisoning Prevention Program Case Management Guidelines, accessed Aug. 29, 2017.